EFS Data Recovery Services | EFS Recovery | Gillware Inc.
Gillware Data Recovery’s experienced data recovery experts can recover EFS-encrypted files and folders from Windows devices. If you have lost EFS-encrypted data due to hard drive failure, accidental deletion or reformatting, or any other form of data loss, the specialists at Gillware have the tools and expertise needed to successfully recover your data. With our secure, affordable world-class services, you can end your search for EFS data recovery professionals at Gillware Data Recovery. Simply follow one of the links below to submit a data recovery case online or receive a free instant price estimate for your EFS data recovery case. Or, if you would prefer to speak with one of our recovery client advisers in person about your EFS data recovery needs, call our toll-free number at 877-624-7206 Ext 1. Need data from an EFS-encrypted hard drive? Let Gillware help. Microsoft’s EFS encryption has been around since Windows 2000. 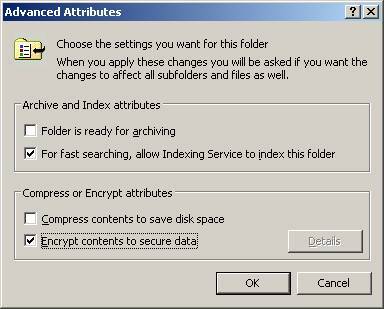 This encryption feature was introduced as a part of NTFS 3.0, and has remained a part of Windows’ NTFS filesystem ever since. EFS is a form of filesystem-level encryption. Whereas other forms of encryption, such as full-disk encryption, will encrypt the entire device, EFS lets users encrypt individual files and folders. EFS encryption is transparent. As long as the user has logged into their Windows profile successfully, Windows will automatically decrypt the encrypted data without making any big fuss about it. The user will hardly even know it’s there. However, if somebody tries to access the encrypted data from another Windows profile, or removes the hard drive and attempts to access its data on another computer, they will be barred from opening the files. Gillware Data Recovery can recover EFS-encrypted files from any brand or model of hard drive, USB flash drive, or solid state device with incredibly high success rates. When you reformat your hard drive or delete your EFS-encrypted data, it might seem like your data is gone for good. But that isn’t necessarily the case. Data can persist, even after accidental deletion or a reformat or system restore. A chain of logical metadata forms a path for your computer to follow to the location of your data. When you delete your files or reformat your hard drive, the data you’ve lost isn’t automatically erased. Instead, your hard drive just breaks a link in the chain so that your computer cannot find the deleted files. The parts of the hard drive containing these files get marked as unused, so as you write new data to the hard drive, you could overwrite the old files. Until then, though, your deleted data can still be recovered. To recover data after file deletion, accidental reformats, or a system restore, our engineers use our own proprietary imaging and analysis software tools. When used by the skilled and intelligent data recovery technicians in our lab, this software helps us recover lost data after files have been deleted or a device has accidentally been reformatted. Your hard drive has many very delicate moving parts inside it. All of your data exists on sensitive hard disk platters. A stack of fragile read/write heads reads data from and writes data to these platters, which spin at thousands of revolutions per minute with the help of a spindle motor. Any of these components can fail, whether due to excessive physical trauma, manufacturing defects, or old age. The firmware governing the hard drive’s behavior or its control board can also fail and make data inaccessible. Hard drives can also become inaccessible and appear to have failed due to boot sector corruption or other logical issues. Broken hard drives will sometimes make repetitive beeping or clicking noises. In some circumstances, a failed control board can produce smoke. No matter what the symptoms are, only a data recovery specialist in a professional data recovery lab can reliably repair a broken hard drive and recover EFS-encrypted data from it. Gillware has world-class success rates. Our data recovery engineers are experts in hard drive repair. We’ve seen every make and model of hard drive fail in just about every way imaginable. With the help of our fault-tolerant data recovery tools and revolutionary hard disk platter burnishing equipment, we can recover your EFS-encrypted files in just about any situation. Broken hard drives even occasionally come to us from other professional data recovery labs after their engineers fail to recover their clients’ data. Why Choose Gillware for EFS Data Recovery? No matter what the problem with your hard drive is, Gillware Data Recovery is your best choice to recover your EFS-encrypted files. On top of our skilled EFS file recovery specialists, Gillware also offers secure and world-class data recovery services at affordable prices. Gillware Data Recovery is one of the top data recovery labs in the USA. Our engineers have received world-class training and have years of experience recovering data from all models of hard drives and other storage devices. Gillware has developed powerful proprietary tools to assist our data recovery specialists that cannot be found at other data recovery companies, such as our hard disk platter burnishing equipment. Among our data recovery experts are computer scientists who have pioneered massive breakthroughs in recovering data from complex RAID arrays, SSDs, USB thumb drives, and other flash media devices. Gillware’s data recovery facilities are fully secure. Our data recovery lab adheres to SOC 2 Type II security standards, with multiple audits per year to ensure that everything is on the level and that your data will only ever leave our lab when it is on its way back to you. The data we recover goes out to you on an encrypted external hard drive to ensure that only you can access your recovered data. We securely wipe all recovered data from our facility one week after we’ve successfully delivered your data, giving you ample time to examine your data and make sure everything works the way it should before we permanently erase your data. Affordable EFS File Recovery: No data? No charge! All of the work Gillware Data Recovery does comes with our financially risk-free guarantee. Our evaluations cost nothing, and we can even cover the cost of inbound shipping for you. We only charge you for our data recovery efforts once we’ve met your goals at an acceptable price. Since 2004, Gillware has operated with one simple ethos: We only want our customers to pay us when we’ve successfully gotten their data back. Gillware’s data recovery services aren’t just financially risk-free. Our prices for our services are, on average, 40% to 50% lower than those of other professional data recovery labs. At Gillware, we believe in offering services that are both high-quality and affordable. If you’re looking for data recovery experts, you don’t need to look anywhere else.